I decided to take some of my own advice and forged out some space to go on a little Easter adventure. A couple of days running amok in the capital has reset my mounting stress levels back to a cool 0 and I feel strangely refreshed for someone who spent the majority of the weekend underground. Here are some of the things I got up to. Fighting past all the little knee-high monsters queuing to the see the dinosaurs, I visited the temporary Coral Reefs exhibition at the National History Museum. Not usually inspired by natural forms, the different shapes and textures were enchanting, lending themselves to different types of mark-making. 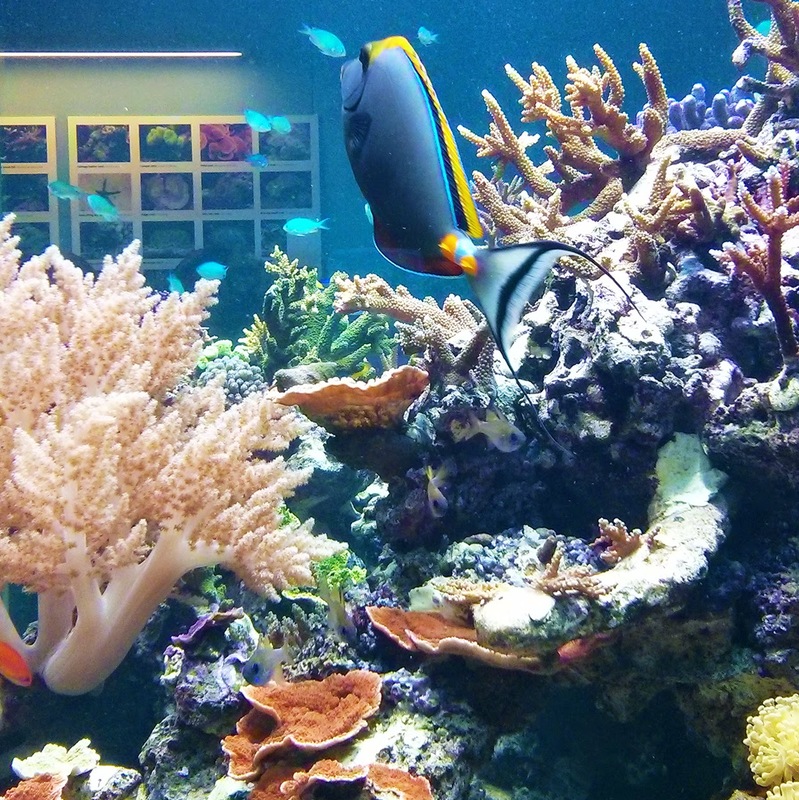 Some of the names were also amazing, such as Slipper Coral and Potato Chip Coral. Sounds like a good combination for a night in if you ask me. 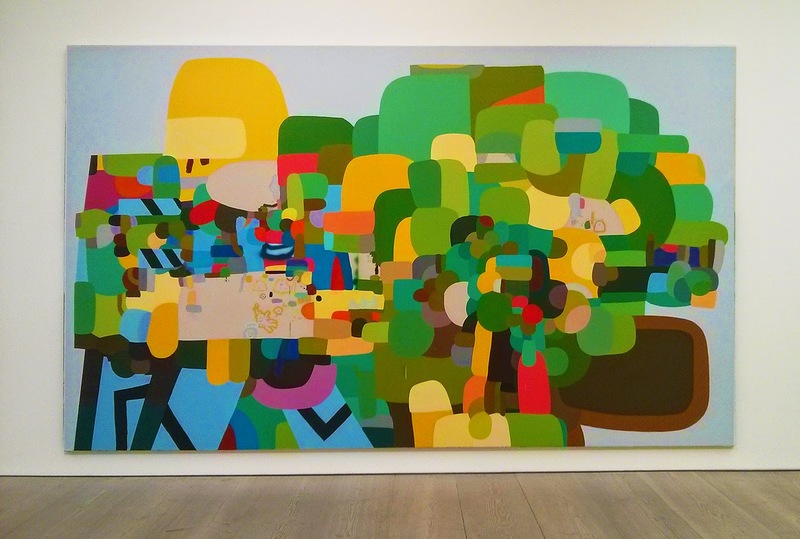 I always like to wander into Saatchi when I'm in London. I mean, it's free, and always full of art that I find I can absorb at a leisurely pace. Pangea II's materiality game was strong, showcasing innovative use of different types of paints, graphite powder, relief cutting and recycled materials such as plastic bags and tyres. My favourite room housed paintings by Federico Herrero (pictured above) alongside mixed media ceramics by Pia Camil, here seen sketched by me. The conversation between the two artist's work was really rich, the paintings making me think of vibrant landscapes of fields, water, soil and sand; the ceramics with an earthy quality, contrasting with their scrumptious graphic shapes and pleasing formal arrangement. If I put a call-out for a travel companion it would have to include "willing to trek to an industrial estate in Walthamstow at the promise of neon". Luckily I have Laurie Ramsell who didn't bat an eyelid at this prospect, and after some careful navigation we were soon having an overpriced Red Stripe in a neon wonderland. 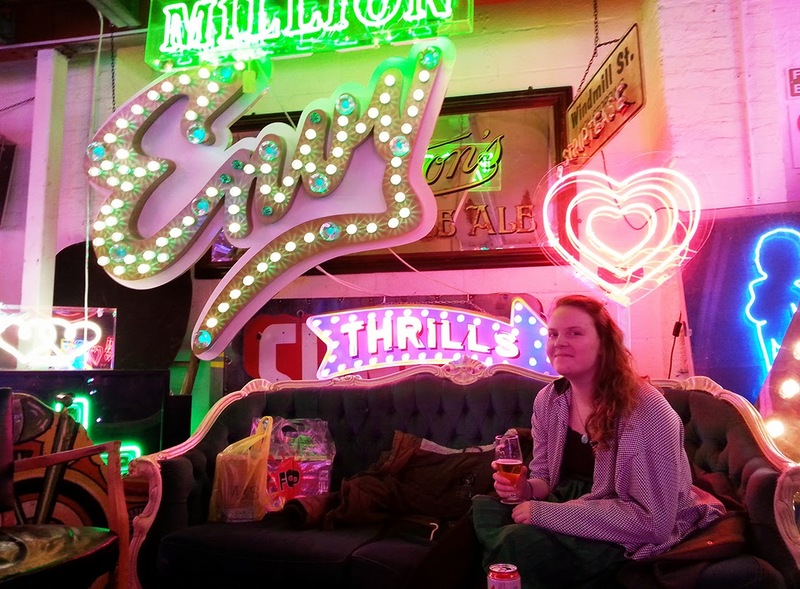 Housing a cafe by the name of The Rolling Scones, God's Own Junkyard is filled with light from a vast collection of neons, vintage bulb signs and old movie props, all collected, salvaged or made by "Neon Man" Chris Bracey. A veritable punchbowl for the senses, it was a fascinating space that made me think conjured daydreams of societal vices, perceptions of glamour and their role in the pursuit of fun in its purest form. Cheers to that.